“I want to reach as many people as I can”, says Maureen Prins, founder of Solar World Cinema. Solar cinema is about empowering society to see the world from a different spectrum. It brings joy and pleasure to people in an innovative way, but there is more behind this project than meets the eye. There is ambition, passion and years of hard work behind the person that created all this. Maureen started this project in 2006 in her motherland, the Netherlands and since then she has never looked back. She travels all around the world “to bring unseen films to unusual places”. 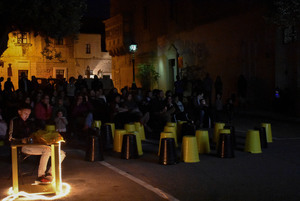 “Solar cinema brings culture to people”, she says. For many of us, cinema is an escape from our daily routine. It is entertainment. It gives us the pleasure to break free from from reality and jump in a world filled with diverse emotions. We are free to choose what we want to see. In turn we are always left with an emotional trigger whether it is fear, happiness or pain. But with solar cinema, everything is elevated. environment because it is powered by solar energy. It is a technical equipment that can reach the far ends of the earth like the dessert where there is no electricity or power. For many people who live in places that lack the basic necessities in the 21st century, Solar Cinema is a gift beyond their own imagination. On the other hand, for me and many others it is an experience. To watch cinema outdoors brings a whole new perspective to the scene. Moreover, what is interesting are the movie clips that are selected to be shown. They are not blockbuster or Hollywood movies but they are independent films. Their representation circles around social issues. 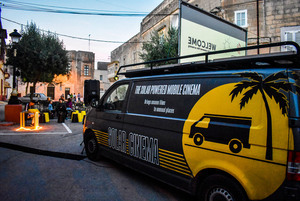 As part of Valletta 2018, Solar World Cinema has been travelling from village to village in the Maltese islands. 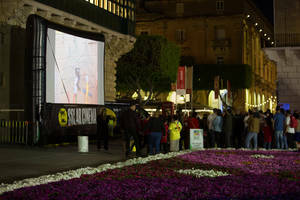 Thus, it has attracted many different age groups all over Malta and Gozo. Amongst them are the many foreigners that have also been captured by this project. As an audience we all had a taste of what Solar Cinema is all about. Maureen has achieved a lot during these years. Some of the countries she has visited so far are Brazil, Croatia and South Africa amongst others. Her dream is to establish Solar Cinema in each continent all over the world. 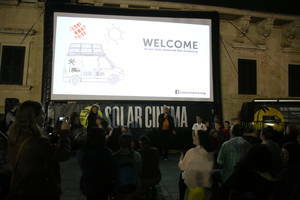 For those who are interested in being part of Solar Cinema World, you can visit http://www.solarcinema.org for more information.